I'm Michael Senoff, and in the next few moments, I'm going to give you a critical advantage over 99.9% of all your family, coworkers and friends when it comes to making extra money. Some might even say it's an "unfair" advantage. Specifically, I'm going to show you how me and my boys have been making a killing buying and flipping all kinds of stuff. Most of the stuff we sell, we either get for free or pay ridiculously low prices. I've been documenting this part time endeavor over the last two years and I'm finally ready to share everything we've learned. Furthermore, I'm going to invite you to accept a valuable package of money making tools entirely without risk. But first, I want to share a story with you. When Steve Jobs, founder of Apple Computers realized he didn't like required courses in his first year at college, he dropped out. He claims it was the best thing he ever did. But at the same time, he dropped "IN" on courses exciting to him. One was on the subject of Calligraphy. He said, "Calligraphy was fascinating and interesting." In a keynote speech to graduates from Stanford University, Jobs claimed that the calligraphy course was responsible for multiple type style fonts we use in our computers today. And for us, it's all the same with sourcing, buying and selling. Every time, we find an item we don't know much about, we can drop IN on a new market. We'll learn something new about the value, the history, the pricing, and the demand. And that's interesting to us. This is specialized knowledge that compounds with each deal and actually pays us BACK in the future. And you can use this information profitably for YOUR future deals. And every time YOU learn something new, your expertise and money making abilities expand exponentially. Your family and friends who don't understand this will walk over dollars to pick up pennies. But, because you've done YOUR research this information is locked into your memory. And you'll NEVER forget it. So, the next time you find something to flip that you have already learned about previously from a garage sale, or a thrift store or on eBay, offerup, letgo, or the nextdoor app, YOUR value alarm will sound and you'll be positioned to profit from your past efforts. Nothing you learn in this business is wasted. However, this is learning is earned by doing. It's learning one must get. It's not going to freely fall in to your lap. But, I can shortcut the process for you. Here's a good example. 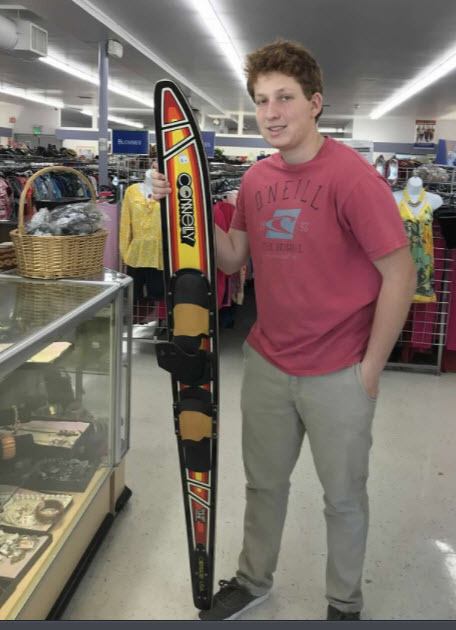 Look at this vintage Connelly short line slalom water ski in the photo above. My son Alan bought it for $6 at a local thrift store. He's researched water skis before. So when he saw it, the alarm sounded. He sold it for $108 only 36 hours later. And we're only playing around with this buying and selling stuff part time. Both my son's are in school full time and I'm working on other projects besides buying and selling. I can't imagine the fun and the money we would be making working this gig full time. I'm truly convinced if you take to heart what your learn in my Money Shot News, you can replace your current job and make more money buying and selling. If you are a student just making their way into the workforce, an entrepreneur, small business owner, inventor, salesperson or even a stay at home dad or mom, you can benefit from my years of street-smart money making experience. Learn from my mistakes. 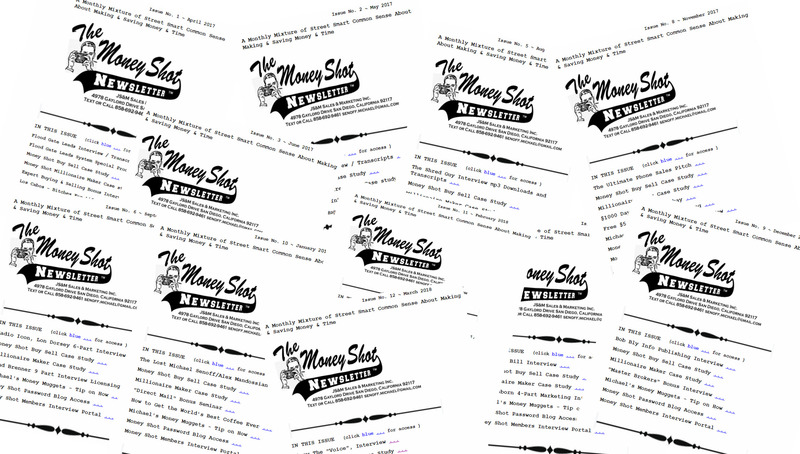 Own step by step plans in my Money Shot Newsletter. Imagine being the first in your area to capitalize on a new business idea that for every dollar you invest can bring you five, twenty or even a hundred times your money. You'll own hundreds of plans completely unknown that can help you do precisely that. You'll feel empowered, happy, and free to do whatever you want. Ride with us in our 1977 Chevy El Camino. Sit shotgun as we drive you around the San Diego neighborhoods and thrift stores. Stand by our side as we negotiate deals. Become a partner in our world. Learn how we think and how we approach buying and selling. It's important. The photo above was taken with my two sons Joseph and Alan. They are shaking hands, doing deals and making money. This was a sale of a working gas dryer we bought for $20 at a garage sale. We sold it for $120. And since I'm already driving the streets and in the stores teaching my sons the arts of sourcing, buying and selling, I figured why not document and share our experiences with YOU!. You'll see the photos of items exactly as I see them. You�ll see the whole process of detailing, staging, listing, and ultimately selling the items we find. You'll see it all from A-to-Z. And, most importantly, I'll show you The Money Shot. You'll see the photographs of our buyer holding up the cash in front of the item they just bought. It's the proof I want you to see each day that what we do really does work. You'll learn by example. All you have to do is open your mind to the possibilities. Take my hand. Follow my lead. Experience the excitement and adrenalin from our deals. Learn new methods for making extra cash. Learn my system for finding the best stuff to sell for maximum profits. I'll show you how to post and list your items fast without taking allot of time. Cash you'll take home to enjoy with YOUR family starting today. Learn to make more money using methods you've never considered until now. 2) "Michael's Money Muggets" These are my little tricks, tips and brain farts and more that I use every day to save time & make money. As I live each day as a businessman, father, brother, son, husband, writer, inventor, publisher, and entrepreneur, I will compile my money muggets. I'll share my thoughts with you in each month's issue of The Money Shot. Some ideas will be thought provoking and worthwhile. But, some thoughts won't amount to a hill of beans. I�m human. I learn from my mistakes the same as anyone. And, I promise I won't hold back delivering you my best ideas in each issue, even the hard lessons I learn. Subscribe today and I'll buy you my last two years of Money Shot Newsletters. * 24 full back issues of the Money Shot News. * Michael Senoff Money Muggets, tips, idea and gifts we've learned about the way. I feel so strongly that my Money Shot News can offer you way more value that the money you pay. Maybe I can illustrate my thoughts in this shot story below called . .
Mark Spitz, who in 1972 won 6 Olympic gold medals went to Indiana University. And his coach was a guy named Doc Councilman, the greatest swim coach in America's history. The first day of practice every fall, Councilman would get all the guys on the swim team to go out on the swim deck. And there was a little banner that hung over the pool. And the banner had three words on it. Doc said, "Okay guys, we're going to spend a lot of time together this year, and if you want to be a part of this swim team, every afternoon, you have to come here for a couple of hours and swim until you hurt. But if you have higher goals and you want to be an NCA champ, you want to be a national champ; you have to come here every afternoon and swim until you're in pain." "If you have still higher goals and you want to be the next Mark Spitz, you want to be a an Olympic champion; you have to come here and train until you're in agony." He said, "So it's your choice. He said, "All of you, I wouldn't have recruited you unless I knew every one of you has world class potential inside of you." Whether you choose the hurt, endure the pain or go all the way to agony, by the time you have dinner, everything is going to go back to normal. So it's how much are you willing to give in that hour or two every day that's going to determine your destiny. Note: It may take a second or two for the order window to open up. Be patient. After your membership subscription is received, you'll be registered into the membership site and your username and password will be sent to the email you used at check out. The second your order is confirmed, I will get you set up in the Money Shot News membership portal. I'll then send you an email with your username and login. After you get access, you'll enjoy a time tested, perfected and a practical money making system proven to fatten your wallet, optimize your profits and save you time and money. You'll also get my last 24 Months of Money Shot News Back issues for FREE - (a $1128.00 value). These are yours to keep as my gift even if you cancel your membership.